You own yourself a pup and he or she is growing steadily and you enjoy all of this. Then there is a moment at which it is time for you to take care of the ears You notice something about the position of the ears (yes they do cetrainly grow). The ears seem to lead a life of their own. At one pup one ear is higher than the other at antoher pup one ear is hanging while the other is standing and again with another pup they look like a nun-cap and at the last one the ears are stadning completely upwards. Wrong! So we are going to do something about this. When is it we have to tape the ears and why we have to do so. The past 100 years, the cut ears had to be carried straight up and the highly appriceated firm cartilage took care of that. 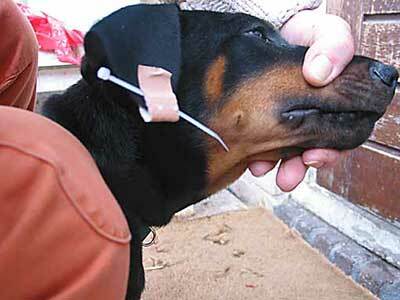 Now, the uncut ears, with the same cartilage, have to hang properly downwards. As the pups grow older, the catilage becomes more firm. 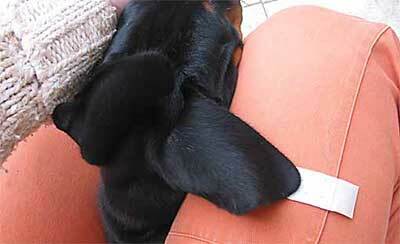 The position of the ears herewith is going to change and are taking a permanent shape. 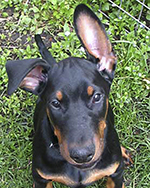 If this taking shape is not directed, mostly ackward wide standing ears, that damage the expression of the dobermann, is the result. 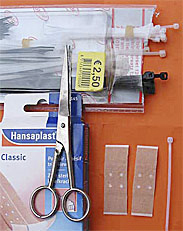 a pack of elastoplast. The inexpensive ones are often the best for this. The most simple thing to do is to get a mat from which you cut 2 pieces in the shape as shown on the right. a shoelace or something like that. I, myself, use wire-binders, they actually are made to hold wires together. This you can buy at every elctronic or building shop. Sometimes, because of the effort the have to put in it, the owners forget about this work. But later they will be sorry for this. 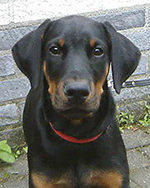 We are going to take care that now and in the future the ears of our dobermann will be shaped correctly and in doing so maintain the expression of the dobermann. 1) Put he dog between you legs and the plaster with the open sticky side upwards and put the end of the ear on the plaster. If you do it with two persons you can do it much easier..
2) Next you stick one side of the plaster to the outside of the pont of the ear and the other side of the plaster to the innerside of the point of the ear. Take care there will remain enough space to lead a shoelace through. This you do with both ears. Now you have a tab at the point of both ears. First you have to firmly press so that it will stick together.. This is the result. Important are the "tabs”. 3) Through both tabs you lead the shoelace or the wire-binder A wire-binder is easy to lead through because of its more solide shape. Tighten the shoelace or the wire-binder, not too tight but also not too loose. 4) Fix it under the throat like on the picture. Not too tight. It must be possible to put your finger without tension between throat and the connected earpoints. The outstanding point of the wire-binder you cut off. At first the pup will not like it and try to get it off, but he/she will get use to it. The pup has to carry this "burden" ( I mentioned before he will quickly get used to it) for 4 or 5 days and then you cut the wire-binder or lease the lace. Then the pup can walk a day without. Keep the plaster and the tabs on its place. don't remove them.! otherwise you remove the hair unnessecary. 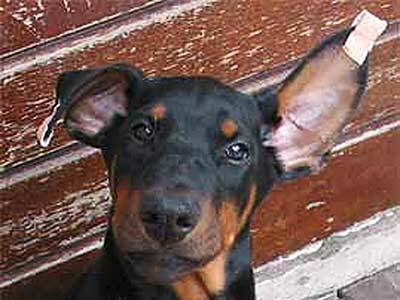 Always look at the inside of the ears for redness or a unhealthy smell . After one day of fresh air, you bring a new wire binder in position and tighten it the same way you did before. Up for the next 4-5 days. If the get loose form itself, you make a new one. Attention: Do always remove the plaster following the hair growth and not against it. A little bit of aceton or ether on a piece of cotton wool will be helpfull to remove the kit, but it is not so good for the pup so be careful when you do this. This taping we do during the period in which the tooth are changing. You have to take care an follow this procedure consequently at the end of this period. Because, when the chalk is not anymore needed for the building of the teeth it is released in the body and will be used for making the body more solid. So the ears also get their part of it and become less flexible. 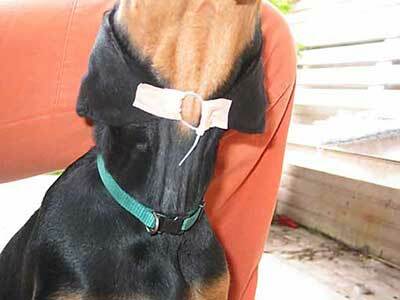 If you beware that in this period the ears are taped, the result will be fine.